When I'm playing a game of SCRABBLE, my friends are not friends and my family is not family anymore. They are my opponents. They are my enemies. Okay, I'm not like this all of the time— most of the time I like to teach my opponents how to play. I want to spread my knowledge, but once I've taught them everything, they're on their own. Soon after the shutdown, Hasbro put up their own Facebook application called SCRABBLE Beta, and what was once Scrabulous is now Lexulous. Due to the lawsuit, Lexulous has changed somewhat from normal SCRABBLE; there's eight letters instead of seven and the board is arranged slightly different. If you're not into Facebook, Lexulous has their own website for playing. If you want to win against all of your friends, whether on Facebook or with the actual SCRABBLE board game, you need to be a master. I'd like to share some of my knowledge, along with a few cheats, tricks and strategies to all of you, so you can conquer your enemies (okay… friends), and eventually, perhaps, beat me. 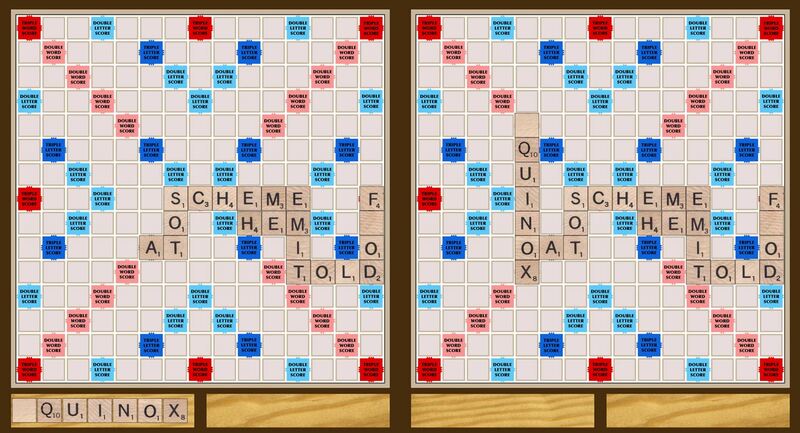 Don't worry—you don't have to be a genius to become a SCRABBLE master (I'm certainly not). You just need to know the important factors and legal cheats to win. I'm sure there's more to know about playing SCRABBLE, but these tips are going to get you one-step closer to master status. 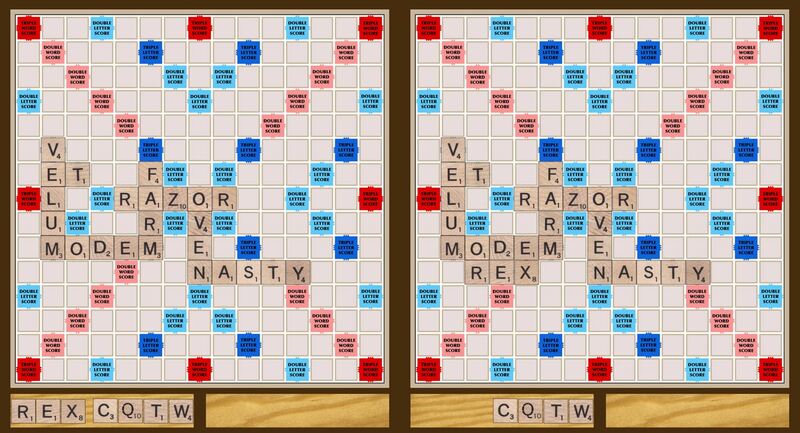 Disclaimer: I can be pretty arrogant when it comes to SCRABBLE, so I'm not really a "master" - I just wish I were. I'd probably lose in the first round of the World SCRABBLE Championship, but that doesn't mean I can't help you improve your game. If you're looking to be the best player ever, I suggest you contact somebody like Nigel Richards. OOGONIUM. QANAT. SIBILATE. CWM. These words might look like gibberish to you, but according to the OSPD (Official SCRABBLE Players Dictionary), these are legitimate words that can be played in SCRABBLE, SCRABBLE Beta, and Lexulous. XYSTER. AA. EXEQUY. HORDEOLA. Try using these in a normal conversation without attracting strange looks. There are thousands of peculiar words out there, each with its own peculiar definition, and there's nothing better than playing one on the board and confusing your friends (or enemies). Now, these are all words listed in the OWL, which stands for the Official Tournament and Club Word List or Tournament Word List, which is the only thing I am familiar with. So, if you're an international player using SOWPODS, acceptable words may be different. Keep that in mind when looking at these tips, because I can't help you win something I'm not familiar with. 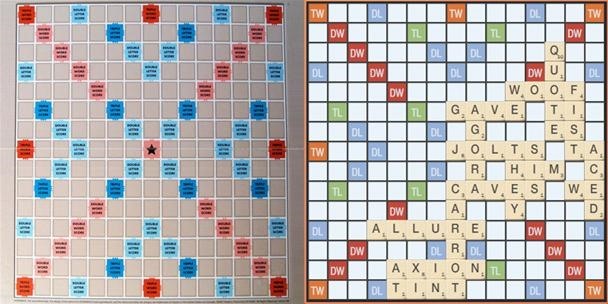 Besides playing SCRABBLE on websites like Facebook, Internet SCRABBLE Club and others listed by the NSA (National SCRABBLE Association), you can simply make your own rules up. You can play with only words you know the definition for, with or without a time limit, or completely opposite with slang, acronyms, proper nouns, and abbreviations. You can even sip on wine and laugh while you use common cuss words and perverse language (I never do this!). 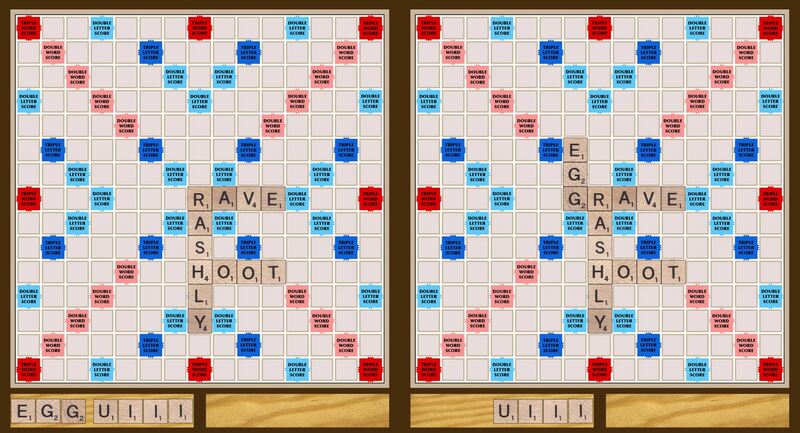 But if you're like me and take your SCRABBLE seriously, there's only one way to play… the official way. To play SCRABBLE by the book, you need to abide by a strict set of guidelines and abide by them forever, because you'll never improve if the rules become mutable. Trust me, I know what I'm talking about. If you already know the proper rules of SCRABBLE, then by all means, skip ahead to the more interesting stuff. But for those of you who aren't familiar, these rules are just the first step to becoming a master. Knowing who goes first or who keeps score isn't important (at least to me), but the following five rules are the key to winning the game. You cannot use proper nouns, acronyms, abbreviations, prefixes or suffixes during gameplay. Also, no words that require apostrophes or hyphens can be used. Foreign words can be used as long as they are in the SCRABBLE Dictionary and are common words used in English. This is a great tactic to trick your trigger-happy challengers. If you use all of your letters from your tile rack at the same time, you get a fifty-point bonus, called a Bingo, but this only pertains to when you actually have seven tiles on your rack (three or four letters on your rack near the endgame does not count). This is one of the main keys to winning SCRABBLE, because it's mega-points and brings the most enjoyment. If you deem a word illegitimate, you have the right to challenge that word, with a little risk involved. If you're right, the challenged player removes his tiles from the board and loses that turn. If you're wrong, they get all of their glorious points while you're stuck missing your upcoming turn. This works best with the SCRABBLE Dictionary in arms reach. On Lexulous, you can choose to turn this option on or off when starting a game. On SCRABBLE Beta, this is not yet an option, which means you can play anything you want, just to see if it's a word or not. You won't get penalized and you can keep trying until you find one. There are plenty of bonus points available on the board, like double letter, triple letter, double word, and triple word scores. Using them is the fastest way to achieving high scores, but once they are used, they cannot be used again. A simple way to remember it is if you can't see it, you can't use it. The pink square with a star in the middle of the board is a double word score, and only the first player gets to use it. For further reference, the bonus squares are commonly called DLS, TLS, DWS, and TWS. Lexulous has changed their board from SCRABBLE's format, but all of the colored bonus squares remain, they're just rearranged a little. The game ends once one player uses all of his remaining tiles on his/her rack. This is the one game where not everybody gets to finish, because only the winner gets the rights to that, not to mention the scoring incentive. The player who wins tallies up all of the points from his/her opponents' racks and adds them to his/her score. To add even more embarrassment to the losers, they get to subtract the remaining tiles they have from their score, leaving them even worse off. This is a great strategy to think about when nearing the end of the game, especially if it's a close one. These five rules are the most important to consider, because each one is crucial to winning the game. If you're a master, you'll learn how to legally twist these rules with cheats and tricks to your advantage. Some might call it petty, but it could be the only way you'll win. Oh, and another rule to consider is not playing SCRABBLE in Atwoodville, Connecticut while waiting for a politician to speak. Apparently it's illegal. I'd like to see them try and arrest me though. Most think it's all about how big your word is, but that's not always the case, although I do love my Bingos. There is more than just getting rid of your letters, and you don't have to memorize the dictionary either (at least not all of it, only some of it). Just like chess, there is a certain degree of strategy involved, and that's where the win lies. If you really want to be a SCRABBLE master, you need to learn patience, defense, and tactics, and all of the following tips and tricks will get you there. If not, well, I never actually said I was a master, did I? You just assumed that. Without knowing these two-letter words, you'll most definitely lose the game. These two-letters can get you out of a jam, help you get rid of excess vowels, and give you building blocks for your next turn. If you're going to memorize anything, these are the 101 words to learn. Learning the three-letter words can help you out just as much as the two-letter ones can, but there are ten times as many, so memorizing them is out of the question (unless you can actually do that). Just knowing a few key ones will improve your game. The following are the most helpful and unbelievable three-letter words, some look like acronyms and some merely look like hogwash. TIP: Remember, a lot of these two- and three-letter words are intuitive. Both the English alphabet and the Greek alphabet can be spelled out. For the most part, sound them out in your head and that's what they'll look like (ex. C=CEE, F=EF, Z=ZEE, and PI, PSI, CHI). Also, think of indication and expression sounds that come out of our mouths. Chances are, they're legal words (ex. UM, ER, MM, HMM, BRR). When you're stuck with a Q on your rack, waiting, waiting, and waiting for that U on your next turn that never comes, it's a good idea to learn the alternatives. There are a total of 33 words that have a Q but no U. These words are a must-know, because the last thing you want to have left on your rack at the end of the game is a ten-point Q. The best way to get that fifty-point bonus is to know how to manage your rack. There are an endless amount of words that end in -S, -ED, -ER, and -ING. When you look at your rack, this is what you're looking for. When you see them, push them to the right side of your rack and look at the remaining letters. Unless you have all vowels or consonants remaining, chances are you can hit a Bingo. Also, try and look for less common suffixes, like -LY, -ENT, -IEST, -FUL, -ITY, -NESS, -CY, -AL, -TION, and -ITE. Aside from suffixes, look for the common prefixes and push them to the left side of your rack. Prefixes like IN-, RE-, and UN- make it on your rack more than anything, so use it to your advantage. Make sure you don't limit yourself to just these three, look for all prefixes you can use, like NON-, EX-, TRI-, PRE-, and MIS-. Everybody loves the big letters J, Q, X, and Z, unless they can't build a word with them. When you have one of these letters, that should be your focus—concentrate on making a word with them. Always look for a bonus square on the board to use, otherwise you're just wasting them. If you're absolutely sick of the letter, find vowels on the board that you can slap the letter next to. Think of QI, JO, XI, XU, AX, OX, EX, and ZA, but still, find that bonus square! 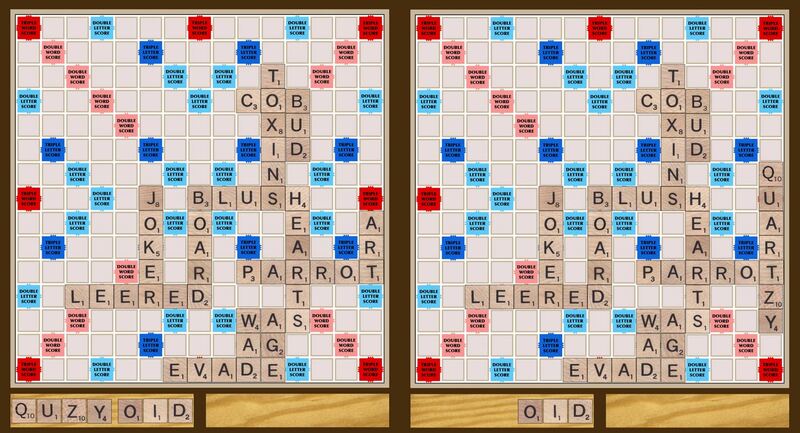 Besides the J, Q, X, and Z, the blank tiles are the most sought out. These wildcards cannot be wasted on a simple CAT an MOUSE. They need to be considered as the steppingstone for your Bingo. Do not waste these! The only excuse you have for using the blanks for Bingo-less words are for high scoring possibilities on the red TWS or when you have a Q and no U. It happens to everybody—the rack of vowels. If you're against exchanging letters, try learning all of the words that are consonant-less (they're aren't many). 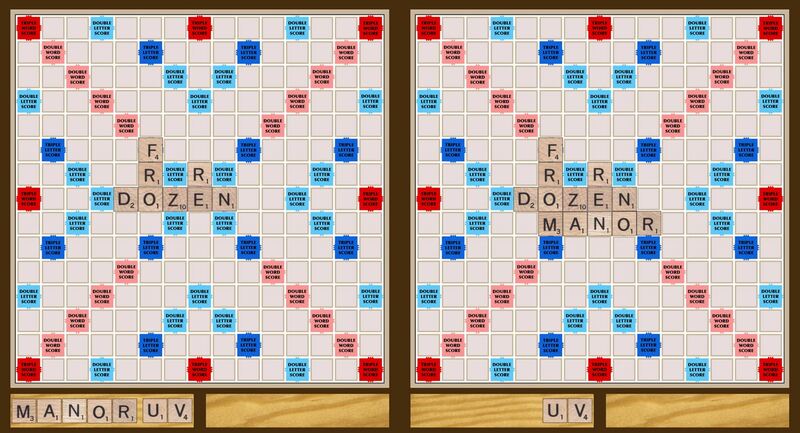 Also, you can use the consonants on the board to get rid of those vowels. It's the easiest way to dump them. Let's say you have a rack that contains an A, E, E, I, A, E, and U, look for an open R on the board to spell ARIA, AREA, AERIE, EERIE, AUREI, or UREA. It's basically like exchanging letters, only you get points, too! Some SCRABBLE players can simply look at a rack and rearrange the tiles in their head (that's me), but some of us need a little visual help. The best way to finding a word is to rearrange the letters on your rack. Eventually, words will form and pop out at you. Like I said, I do it in my head, because I don't want the others to see me think. On both Lexulous and SCRABBLE Beta, there's a shuffle button for your convenience. 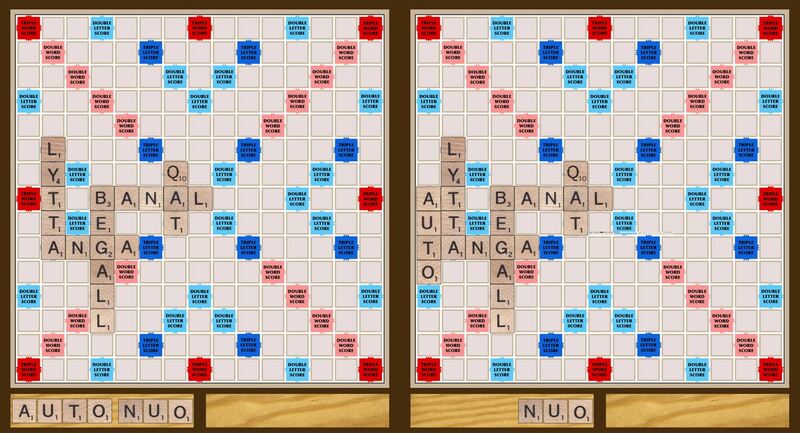 Exchanging is an absolute last resort in SCRABBLE. I think I've done it once. Only exchange letters if you absolutely cannot spell a word, or if you really, really just hate your rack. You give up your turn for this, so make sure it's a wise decision. If you're winning by an enormous amount, then sure, do it. If you're losing by an extreme amount, it might be the only thing that changes your luck. 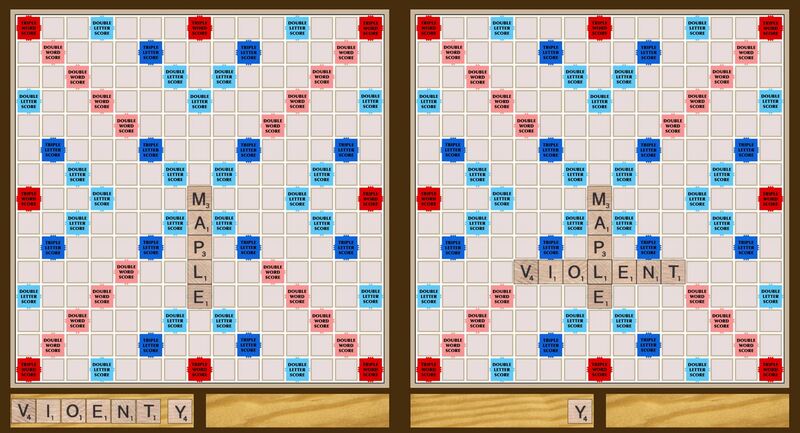 If you have all vowels, in could really benefit you to exchange. The same goes for if you have all high value letters that don't mesh well. Just keep in mind, the best solution is finding something on the board. Only use this option for emergencies. 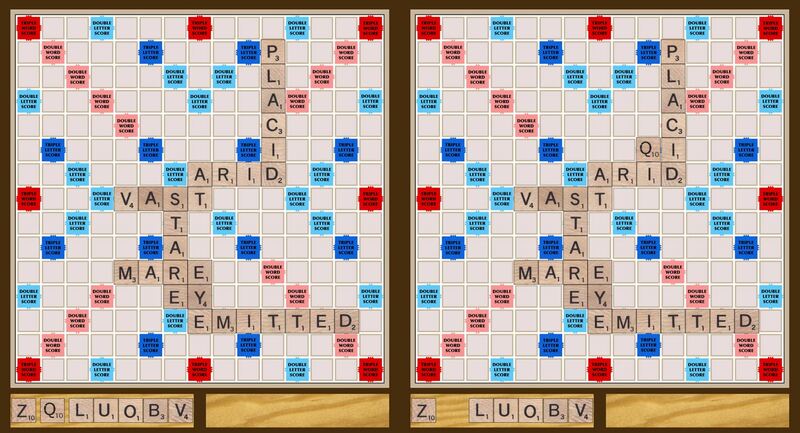 On Lexulous and SCRABBLE Beta, exchanging is referred to as swapping. You're so close to getting that fifty-point bonus, but only one letter on your rack is screwing you up. Well, give it a chance and be patient, don't force yourself to abandon it. Play that one crappy letter on the board, and hope that your future holds the tile you need. Always leave your Bingo possibility on your rack, unless you know it will never come to you, as in tracking (more on tracking later). The best combination to get on your rack is RETAINS. The word itself is telling you to hold on and prepare for a Bingo. You can easily make a seven-letter word in any combination with these letters, and it's easy to even build an eight-letter word with the boards help. On Lexulous, if you use seven off your rack, you get a forty-point bonus, and if you use all eight, you get the fifty big ones. 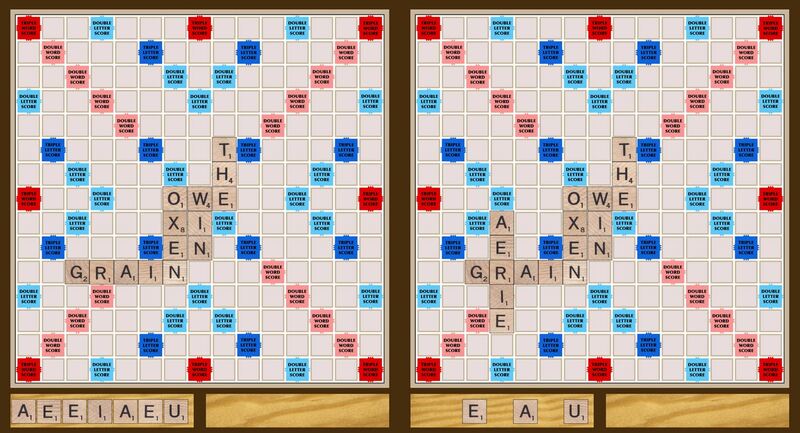 ETAERIO is the seven-letter word most likely to appear on your SCRABBLE rack. 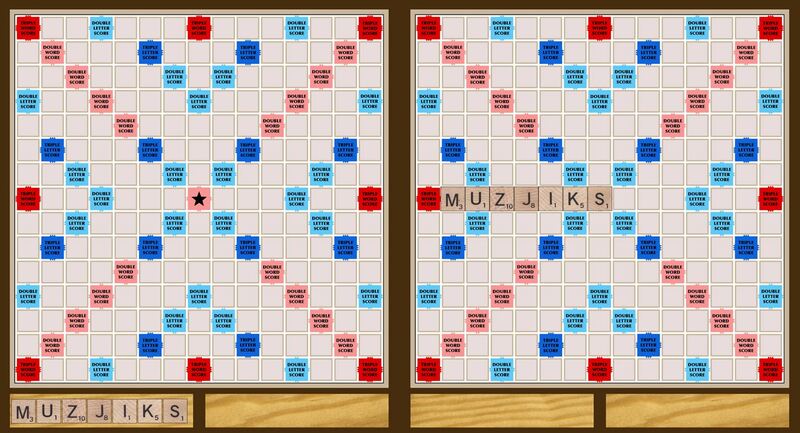 On the first turn, the highest possible score a player can get is for the word MUZJIKS (128 points). QUARTZY (164 points) is the highest score possible for a seven-letter word, played across a TWS square with the Z or Q on a DWS square. OXYPHENBUTAZONE is the highest possible score for a single play, scoring 1,778 points. You just have to play it right. Check out this video that shows one possibility for 1,467 points. This is the most common way to get more points out of your playable words. A hook is when you add a letter to a word already on the board, like turning RAVE into GRAVE or RAVEL. An S is the easiest possibility, like changing HOOT to SHOOT or HOOTS. That one letter gives you a chance to a build a whole other word in the opposite direction as the already played word. You then get all of the points for your word, plus all of the points for the already played word (minus the bonus squares that can't be used again). 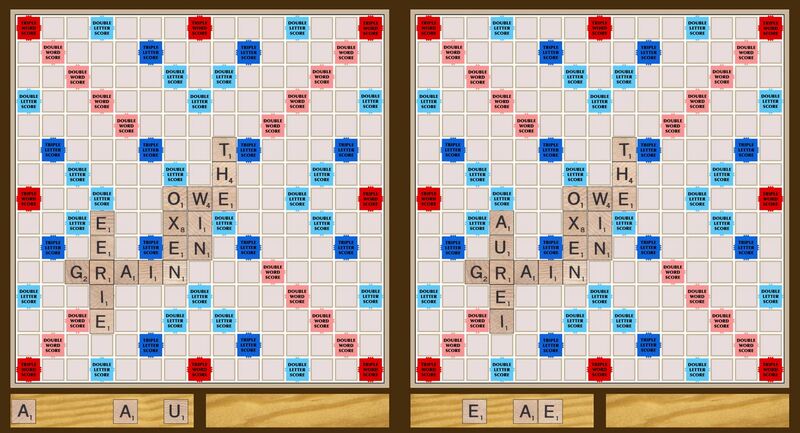 Using the parallels strategy comes in handy when you have a bunch of low point tiles, like vowels. 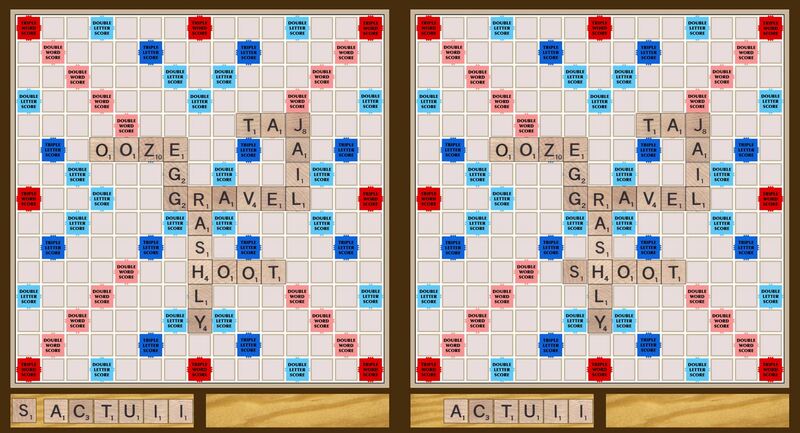 You simply look for a word that you can play parallel to another word already on the SCRABBLE board. This is a great way to get points out of nothing, because you score for each new word formed. To use this tactic, sometimes it's easier to try and build the word on the board and not on your rack first. 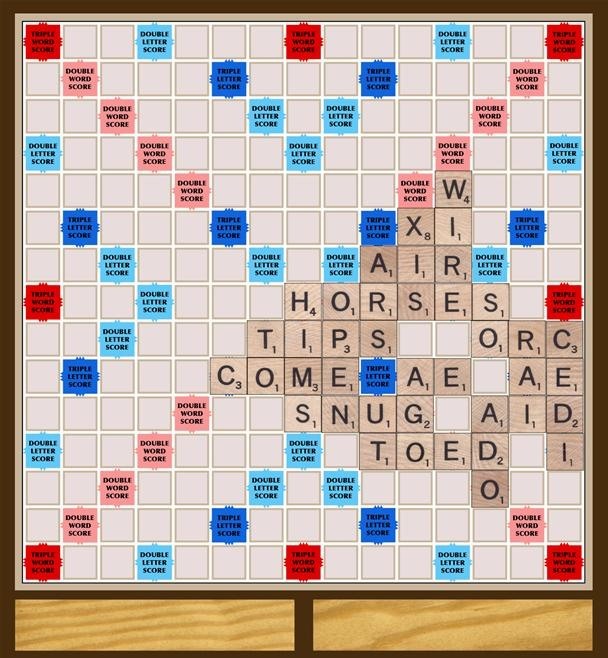 Look at the words on the board and find a sweet spot, one with a high value letter or one next a bonus square that you can effectively use twice. Then, build your word from there. When you know how to use those colored bonus squares to your advantage, you can easily get a triple-digit score in just one turn. The TWS square is the most wanted on the board. Everybody vies for it, but most of the time it's used ineffectively. Sure, when it becomes available to you, don't pass it up, but if you have all one-point letters, you're not really get the most out of it. In this case, it could be better to build your word right beside the TWS. If there are too many letters there, your opponent might not even bother with it on their turn, then you swoop in and build a parallel word, hence using it twice for mega-points. The same goes for the DWS. You can also set yourself up for your next turn. Build words next to the TWS with an I right beside it, maybe two I's beside it. 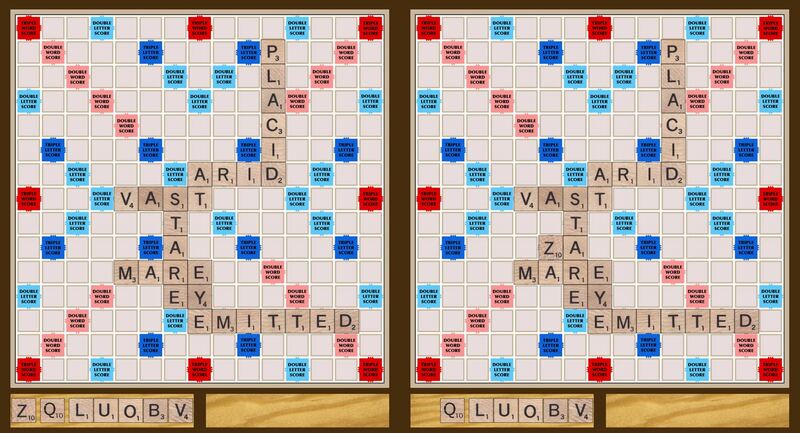 Then, you simply pop your Q in there spelling QI twice in both directions and you instantly have 62 points. The same goes for an A, where you can spell ZA twice for 62 points. The best way to piss off your enemies is by maximizing your bonus squares to the fullest. Use a combination of bonuses, like but a K on the TLS and continue your word to the DWS. The best possible scenario is using two TWS or DWS squares at the same time. It's nearly impossible, but just think… triple or double your score and then triple or double it again! Also, if your opponent opens a TWS up and you can't use it, try opening up another one so you have at least one chance at big points. 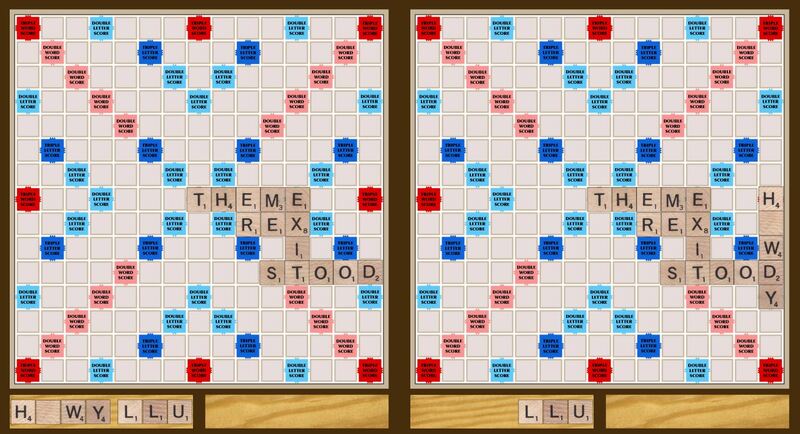 Again, the Lexulous board is slightly different than SCRABBLE, but the idea is the same. Be careful of what letters you play on the middle square. If you place a vowel or an S, D, R, or T there, your opponent will have an easy time scoring a Bingo all the way up to the TWS. Also avoid placing vowels next to the DWS squares. This is the first step to helping yourself out on the SCRABBLE board. Bingos are the most attractive way to open the board up, but when you can't do that, five- to six-letter words are a great way to provide more opportunities on the board. Just remember that it also gives your opponent more options to work with, so be careful. There may be situations where opening the board up is not an option, so do the opposite – close it! Your opponent may be a Bingo Master, but he'll have a much harder time finding a spot on the board if there is less to build from. Use parallel words as much as you can so it makes it impossible to build words. However, the more you close the board for your enemy, the more you close it for yourself. Usually, it's only a good idea if you have a surplus of vowels and can't get any high value letters. A good offense is always a good defense. Don't give your opponents a chance to use a TWS or a DWS, because they'll use it. Rarely do they ever pass it up. If you have to near a high value square, try putting letters next to it that are difficult to build onto, like a Q, K, J, Z, C, U, or V. This is a good offensive option, too, because you might be able to set yourself up for the TWS or DWS if you already have a word for your next turn. Aside from simply avoiding the colored squares, try rendering them useless. If you can't use them, don't let the other players either! Build words parallel to sweet spots with strategic letters and force them to make a parallel word to use it. Most times they can't, unless you give them all vowels and an R or L. If you have an idea for a word for your next turn, make it impossible for your opponents to steal your spot by blocking it. It doesn't always work, but sometimes it's worth a shot. An important thing to consider is which letters are used up and which ones are left in the bag. You can always adjust your game to fit what's left in the bag, giving you the upper hand. This can be quite monotonous to perform, but sometimes the best strategies are the worst ones to handle. Tracking is extremely important when it comes to the end of the game. Knowing what's on their rack could be the key to winning the game (see The End under Other Strategies). If it's too early to start tracking, try a little Poker strategy to help you out. Reading your opponents could help you out in the beginning when it's impossible to tell what letters they have. If you read them right, you could effectively block them or set yourself up. If they are placing one or two letters down at a time, they could be nearing a Bingo, so you might think about blocking. If they are putting horrible three-letter words down, they could just be inexperienced and you can do whatever you want. Watch how hard they think, because the harder they think might mean having a hideous rack. Keep track of what part of the board they are eying up, and then steal their spot! It's never easy to read your opponents, but every once in a while it works. Obviously, this is not easy (or possible) for the Facebook apps. One tactic that can be a total Hail Mary is sacrificing. If you have an idea to set yourself up for your next turn, give it a shot. You may have a word that will get you a Bingo or a triple-digit score on your next turn if you play a certain letter first, but you always run the risk of the other players stealing that special spot before it comes back around to you. There's a lot of reasons for sacrificing, and if you read them right, you can possibly pull it off, but if not, it could just be a wasted turn. You could even lose the game. 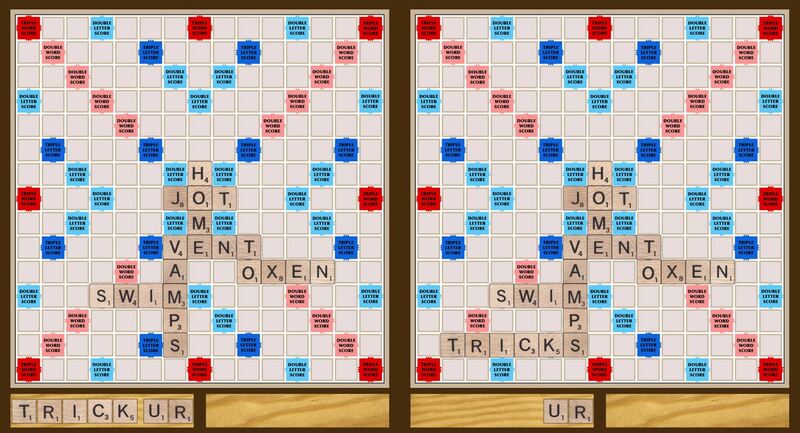 For some SCRABBLE players, turnover is the key to big scoring. If you think about it, the more letters you use, the more letters you get back, and the less your opponents will have. Using more letters means having a better chance to get the high value letters. If you consistently shell out five- to seven-letter words, by the end of the game you could have had sixty percent of the bag, which means you probably had the best letters and the highest score. Bluffing is a dangerous game, but if done well, could be the most important item in your arsenal. Spelling out blatant lies on the board can only be done with a good poker face, so make sure you know what you're doing. Most Scrabblers want nothing to do with fake words and will hate you for it, so watch out. I'm one of those players. There's always an alternative to putting down actual fake words, and that's playing words that look fake to the inexperience player, but aren't. Study up on obscure words and force your opponent to challenge you. They'll lose their turn, and you'll rake in the points. Aside from obscure words, look into foreign words that are acceptable in the SCRABBLE Dictionary. The other players will fight with you about "no foreign" words on the board, and you'll stick to your guns and tell them to challenge you. And here are a few of my favorite words that can be spelled in many different ways. One of the last things to consider is the endgame. If you plan it right, with a combination of tracking and a little math, you could win by just a single point. It could be a very tight score and you'll need to know what they have. You could be losing. Either way, plan your last move out perfect. One time, my opponent was bragging about how he won the game, but I used all of my letters, added my score up, added his leftover tiles to mine and subtracted them from his, causing me to win by a measly one point. Also make sure to get rid of all of your high value letters is you think your opponent will go out first. Getting stuck with a Z will lose you ten points and give the winner ten more. That's it! You're on your way to becoming a SCRABBLE Master and annihilating all of your Facebook opponents. To get even better-- practice! You'll never get any better if you don't practice. Also try playing other word games in your spare time, like anagrams or jumbles. I play jumbles, crosswords, and I even have a SCRABBLE calendar. I also pile up on SCRABBLE anagram books and such, just to stay in shape. If you absolutely have to cheat online, Lexical Word Finder will tell you your best options and where to place them, not only in SCRABBLE, but also in Lexulous, Super SCRABBLE, Literati, and more. 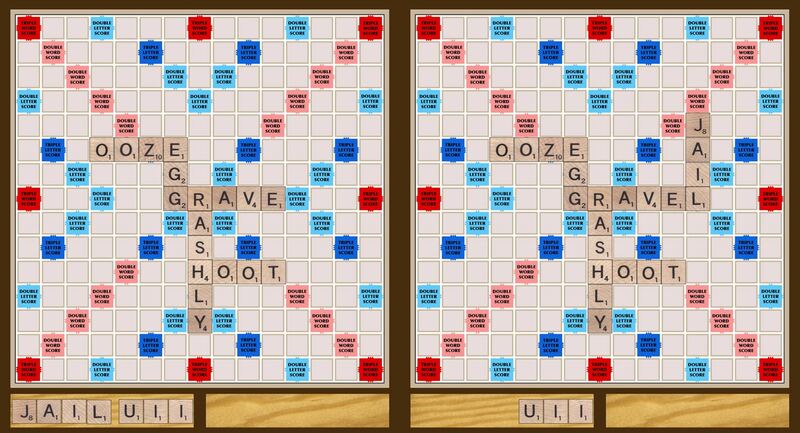 And Scrabble Solver will show you all of your options on your rack. 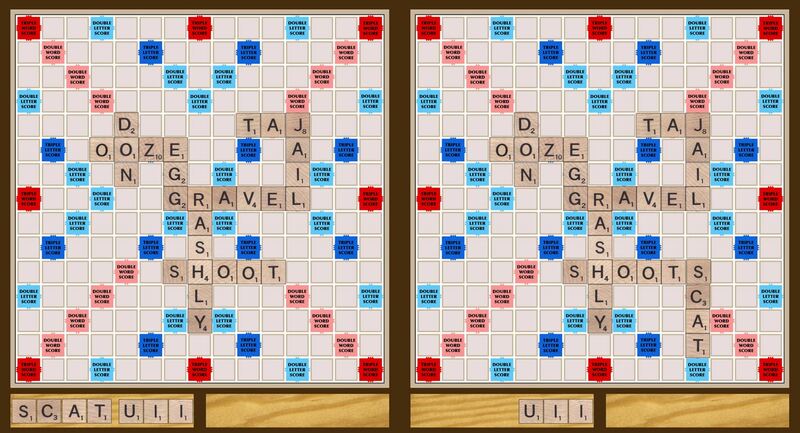 Besides blatant cheating, they're actually good tools for those just starting out in the world of SCRABBLE. I know the people I play against online use them and I hate them for it, but that's life I guess. If you want to test your newfound Scrabble skills out, make sure to check out our Scrabble puzzles and see if you can get the right answers. Also, make sure to like Scrabble World on Facebook and follow it on Twitter! Fantastic How to....! ! ! ! ! Great intro for the newcomer, not too devious. Brillinat. I was surprised the plurals were acceptable though. Check out Abble Dabble. It is a great new twist to word games, it is like yoga for the mind. There's this simple widget for the Mac dashboard which shows you all of the two-letter words with definitions, one at a time, with a new one appearing every time you open up the dashboard. I don't think there is a three-letter widget anywhere though. Great summary of tactics and strategies! I especially found helpful your list of words that seem incorrectly spelled but are not. I've been trying to memorize some of the short 2 & 3 letter word combinations. Most of the time I just remember any combination that involves a "J", "Z" or "X." I am pretty new to scrabble and other word games as I just started playing Scrabble and Words with Friends online this past July (thanks to my recent iPad purchase). I play primarily online ans usually mostly Words with Friends, and I have received a lot of knowledge and strategy from players like you. I started using a new app called 'Cheats and Words' to further assist in my vocabulary and player development. Most of the time I use it to find out words that I could have played differently, long after a game has ended. I have learned a lot about word placement as a result. I'm glad this article helped you out! And as I explained in this recent comment from another article, I'm a little weary of "Cheats & Words" as an educational tool, because of the amount of people who would use it as just a "cheating" tool. But I like that you mentioned it could be used after the game has ended, to see what you could have done differently. That could definitely be useful, but I wonder how many people would actually use it in that manner? That's a very good question. There are probably less than more people that do. Does anyone play WORDS on facebook? How do we earn tokens with which to gain tracking and other benefits? Thanks. I love scrabble but I had no idea there were so many strategies. I kinda just made words. Liv&learn..
Scrabble is probably the most classic word board game and loved by many. 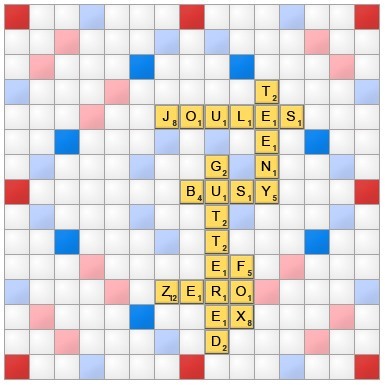 Essentially, it's a crossword style word game, each player has to form words from tiles, which have individual letters printed on a board marked by a grid. Thanks Justin. I'd love to hear your thoughts on a "top x" for newbies. Just got into Scrabble and I like to approach things rather methodically, i.e pick a strategy or 2, work on it exclusively, then add 1, then another and really work each one awhile before adding more. Perhaps a future article? Or other readers could help build a list? from most important strategy downwards? Hi, I've just been playing for three weeks, and my ELO score has risen by 200 points, so of course I'm enjoying that. The challenge I am running into is that 90% of my opponents abandon the game, and eventually I give up and force forfeit them. I thought it was just the lower level players, but I have a player with almost 300 points on my current score who is suddenly refusing to move now that I pulled ahead 60 points after s/he led me the rest of the game. We each have two tiles left, and s/he refuses to move after being prompt before. Is this supposed to help that player if they abandon the game or just keep me from getting the win? It doesn't seem random, and it's disappointing. I've one 17 and lost 5, mostly in the beginning, but I've had to force forfeit several dozen after a week or more of waiting. Or, am I doing it wrong? Haven't found anything that explains this well. After I force forfeited a player who had been not playing for over a week, my score didn't change at all. So, I am unclear on how this affects my score.